The De Tomaso Pantera is far from the most well-known of classic Italian supercars, but even more obscure is its predecessor: the De Tomaso Mangusta. Where the Pantera featured a relatively modern unibody structure, the earlier Mangusta was a bit more unique in its construction, utilizing a pressed steel backbone with a tubular rear subframe, although both were given similar wedgy styling by Italian design and coachbuilding firm Ghia, and both carried a Ford V8 mounted mid-ship, just behind the driver. The De Tomaso Mangusta is lesser known than the Pantera primarily because it was produced in far smaller numbers, with just 400 examples or so being built between 1967 and 1971. Now, one of those 400 – complete with its original, 302-cubic-inch Ford V8 and 5-speed ZF manual – is up for sale from Streetside Classics in Florida. The subject of a restoration in 2016, this 1969 De Tomaso Mangusta was put into storage about a decade after its initial sale, by which point it had done precious few miles. Today, the 49-year-old Italian supercar shows just 8,783 miles on its odometer, still wears its original gold paint, and has reportedly had just two previous owners. Giorgetto Giugiaro, who designed the De Tomaso Mangusta while at Ghia, has had a singularly illustrious career. He was responsible for such sensational designs as the original Maserati Ghibli (1967-’73), the DeLorean DMC-12 (1981-’83), and the Series 1 Lotus Espirit (1976-’78). Perhaps it’s these automobiles the jury had in mind when they awarded Giugiaro “Car Designer of the Century” in 1999, but we rather feel the Mangusta – with its subtle curvature and unique, center-hinged split rear engine bay doors – is just as worthy of attention. 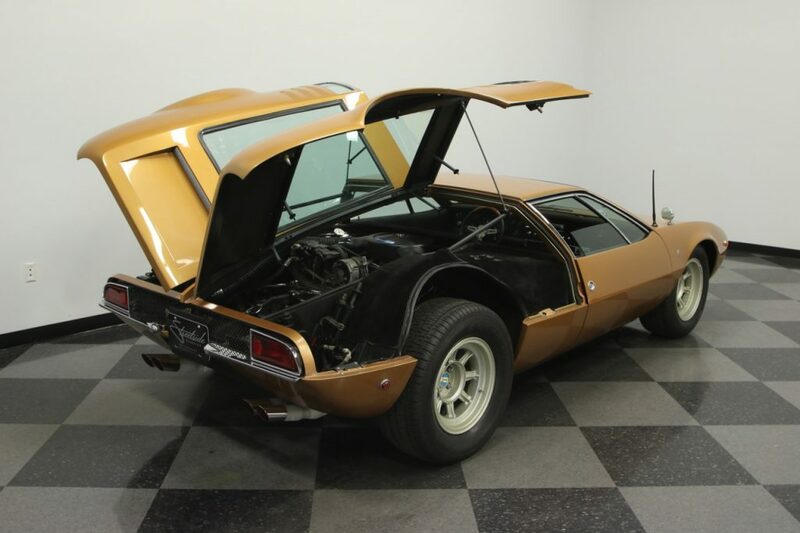 For more photos and info on this low-mileage, 1969 De Tomaso Mangusta, click here for the Streetside classics listing.